The Forest of Marston Vale were delighted to be presented with a cheque for £1000 from local family-run business, Canoe Trail on Wednesday 6th January. This generous New Year donation was raised from the outdoor activities and adventures that Canoe Trail run from Matchstick Wood which is part of the Grange Estate, Willington – a woodland site owned by The Forest of Marston Vale Charity. 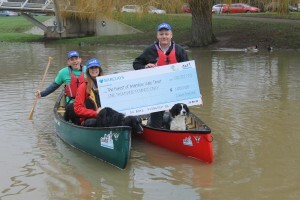 For a company that promotes outdoor action and adventure it was only natural that Canoe Trail’s Richard and Ashley made the cheque presentation to the Charity’s CEO, Nick Webb in a canoe, close to the Butterfly Bridge, at Bedford’s Embankment. It is hoped that this donation will be the first of many as the partnership between Canoe Trail and The Forest of Marston Vale develops. Canoe Trail offer a wide range of activities from the Grange Estate, including wild camping, bushcraft skills, canoeing, kayaking and paddle boarding as well as low ropes challenges and archery – all of which reflect The Forest of Marston Vale’s mission to provide community woodlands for people to enjoy a wide variety of recreational activities. Wanderings in Willington Woods: Buzzing!